From the East. Highway 92 crosses both I 280 and 101 at San Mateo. Just take highway 92 west to Half Moon Bay. As you enter Half Moon Bay you will see signs for Highway 1 north...just turn right and you will see Pillar Point RV Park about 3 miles up. Look for the three tall flag poles on your left. From San Francisco...Depending on where you are, 101 south runs into 280 south, then highway 1 south...Pillar Point RV Park is three miles south of Montara. Look for the three tall flag poles on your right. From Oakland and the East Bay..Take the Bay Bridge across to San Francisco.You'll be on highway 80. Take 101 south. Then take 280 south. Then, Highway 1 south. 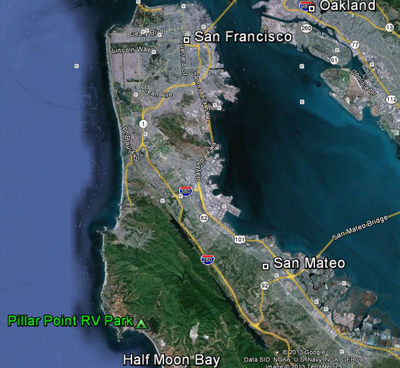 Three miles south of Montara is Pillar Point RV Park. Look for the three tall flag poles on your right. From the west. Put your RV on a large boat in Honolulu. Sail about 3,000 miles to Pillar Point Harbor. Take your RV off the boat, drive about 1/4 mile south. Look for the three tall flag poles on your right. Brian Lowe directions from Sacramento?